PITTSFIELD - Like its title, the small and winning new musical "See Rock City & Other Destinations" finds a singular attractiveness in tourist attractions. In a series of vignettes - musical postcards, really - it takes us from Rock City, Ga., to the Alamo, Coney Island, Niagara Falls . . . a whole souvenir album's worth of sights to see. But what we're really seeing in this musical, now receiving its first full production at the Barrington Stage Company's Musical Theatre Lab, is not so much the nation as a few of the people who live in it. The landscape provides a backdrop, just as projections on a giant "billboard" in Brian Prather's minimalist set offer clues to each setting, but the real focus of Adam Mathias's book and Brad Alexander's music is on the interior landscapes of a succession of characters: not the United States of America, but the unsettled states of Americans. The first traveler we meet is Jess, a young man who, apparently on a whim, has decided to follow the advice painted on countless barns in Georgia and drive to see Rock City. Also on a whim, Dodi, the waitress who serves him at a diner, decides to go along. After a sweetly awkward car ride, the pair arrives at Rock City, which is, in fact, an arrangement of big rocks that, if you squint just right, kind of looks like a city. What makes it interesting is the way each character reacts: Gwen Hollander's sassy Dodi with wonder at the panoramic view, Benjamin Schrader's slightly doofusy Jess with disappointment that he still hasn't found what he's seeking. In "Mile After Mile," a neatly crafted duet, we hear both what they're seeing and what they're longing for. But then the scene ends, and next thing you know we're in Roswell, N.M., with an endearing kook named Evan. Perhaps the episodic-sounding title and the program should have been enough to clue us in to the abruptness of this shift, but the show itself should also give us a sense of what to expect - some kind of framing device, a transition, or even something as simple as showing more of the sights besides Rock City in the show's opening moments would do the trick. As it is, Evan's amusing stakeout for alien visitors is even more disorienting than it might be; I kept wondering what happened to Jess and Dodi. By the next scene, at the Alamo, I realized they were gone for good (though that turned out not to be quite right, either) and settled down into a different mood - collaged stories, not coherent narrative - but I'd have been happier with more of a map. Then, whoops, back to Roswell, then on to Glacier Bay, Alaska (for another sweet-but-smart vignette, of three wildly different sisters dispersing their father's ashes), Roswell again, a moving but overlong exploration of conflicted adolescent yearnings at Coney Island, and finally Niagara Falls. Here, a young bride-to-be's flight from her impending wedding creates a hilarious climax - then morphs into something more complicated, even a little otherworldly, that draws the show's disparate threads together into a surprising but satisfying whole. It's a fine end to the journey, and one that shows the promise of this new musical team. But it would be great to have a few more signposts along the way. 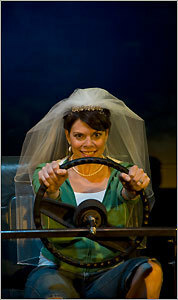 (Kevin Sprague) Jill Abramovitz plays a bride-to-be making a run for it in "Seek Rock City & Other Destinations." Directed by: Kevin Del Aguila. Music direction, Vadim Feichtner. Sets, Brian Prather. Costumes, Mark Mariani. Lights, David F. Segal. Sound, Jillian Marie Walker. Presented by: Barrington Stage Company Musical Theatre Lab.